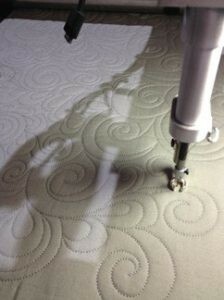 Please email me if you are interested in discussing quilting options for your quilt tops. I will get back to you as soon as possible. A 25% deposit of your estimated bill is required when you leave your quilt with me. Payment of the remaining balance is due at the time of pick up. I accept checks, cash (who wouldn’t?? but please do not send cash in the mail) and PayPal. If you would like to pay via PayPal, send me your email address and I will send you a PayPal invoice. PayPal accounts are not required to pay when using a Visa or MasterCard. PayPal is a secure form of sending payments that I have trusted for years. Shipping and Insurance – Please contact me before shipping your quilt so that I will know to expect it. Insure your package and I will also insure it on its way back home. Return shipping costs will be added to your bill. Payment must be received before the quilt is returned to you.